This basket has a diameter of about 10.5 in, a height of about 2 in and a Net WT of 2.75 pounds. This hand-woven willow basket is filled with some of the tastiest and best Nuts you can munch on: Giant Whole Cashews, Colossal California Pistachios, Superior Mixed Nuts, Delicious California Almonds and Honey Roasted Extra Large Virginia Peanuts. Our handsome woven basket is divided into generous compartments and when the Nuts are gone, this reusable tray is handy for storage or display. Superior Nut Company - Nut Gift Basket - Net Wt. 2lbs 12oz. Great assortment of nuts in a basket! It was a Father's Day gift for my dad and it's the second time that I've ordered this particular basket. He and my family were very pleased with it. But I think next time I'll order the large basket. Prosordered them a week earlier and they came exactly as I asked. Great service. My mother thoroughly enjoyed this gift! "I have only good things to say about the basket of nuts. It arrived in good condition. The nuts are fresh and delicious." Very fresh and delicious. I've ordered this before and will again. Great Company I will use again. My Dad loved the nuts. The best he has ever had he says. On time delivery too! The 23rd of December. Awesome job by your staff. Do you have any coupons for future purchases? It's always hard to buy for my dad. He loves the variety and quality of nuts. I gave two gifts from your company and received good reports back on both of them. I will order from you again. Sent this to my father in law for Christmas. He loved it! Said the nuts were fresh and tasty. Great company -- easy to order and work with. Great gifts to share with family and friends! As usual, all items were fresh and were delicious. I purchased this gift for my parents for Christmas! They loved it - absolutely delicious, they said! ProsFree shipping! Great service! Nice reusable dish. Sent as a gift. The "feedback" was excellent!! Best Place for Nuts and stuff! Can't beat these nuts - presented well, shipped on time, decent price and the taste is Superior!!! ProsQuality, described exactly, enjoyable to eat. I was very pleased with the whole purchase. The gift arrived on time and in good condition and my dad said the Nuts were fresh and tasted great! Good job Superior Nut Co. I will definitely order again! This was a gift and greatly enjoyed by the recipient. The product was great, but the delivery was unacceptable. I chose FedEx Home Delivery to have the package delivered by Father's Day, and it stated to be delivered by Saturday before. However, it did not arrive until the day after. This is the 2nd time that I purchased this item as a gift. My husband LOVED it. I will definitely purchase again!! All the nuts were fresh and absolutely delicious!! Purchased as a gift and the recipient was very happy with the product. ProsCashews, pistachios and almonds are the best we have ever tasted. ConsGlazed peanuts were our least favorite item and not as fresh in bite or overall taste. The peanuts were a gift and the recipient was very excited and pleased with the product. My sister loved this gift. She said the nuts were very fresh and favorable and the basket was a nice size. This gift arrived to my family quickly and packaged securely. they loved the variety and noted how fresh and delicious this selection of nuts were. great! Delicious - loved the variety! The gift item was shipped to a family member in a different state so I didn't have the first hand experience of sampling the nuts but understand they were excellent. From a consumers experience the WEBsite was excellent, order placing was easy and I was always kept well informed of the delivery. The package arrived on time and overall I couldn't be more pleased with the excellent service. Thank you. I bought this selection for a very dear friend. He's 89 years old and has everything, so this was something he enjoys and will spend happy hours eating the nuts. The quality of the nuts in the basket were wonderful. When the wrapping was removed, the smell of freshly roasted nuts filled the room. Thank you for a wonderful product! Proseverything, fresh, nice appearance and the nuts are the best quality. Wanted to order in time for Christmas, but got offered discounts and sales, only AFTER I ordered. In fact the very next day. That didn't sit too well with me. But the nuts are good as always. Sent as a Christmas gift. Recipient was very pleased. Delivered on time for daughter's birthday/ She found them to be top quality. They are in the center of her table. ProsPackaging and the quality of the product. ConsNothing -- I wish I would have bought myself one. This is my third time ordering the Five Section Nut basket for my parents and they always rave that the nuts are fresh and delicious! The nut baskets make great gifts, and Superior Nut Company has many options to choose from. ProsOrdering and delivery is quick and easy. The cashews and pistachios were singled out as the favorites of my recipients. Our birthday guy loved this nut basket. I gave him Superior Nuts for Christmas and the whole family pounced on them, and I gave him another basket for his 88th birthday. Everyone raved about these Superior nuts. Wish I could have tasted them but I live 2000 miles away. Their freshness was commented on over and over. ProsI don't get to eat them so I don't know! I do like the ease of ordering, and it's a nice user-friendly web site. ConsI don't get to eat them. I have purchased this nut basket several times, once for my family and other times for friends. Everyone has enjoyed the nuts and commented how good and fresh they were. I love nuts, these are exceptional, and I am sure I will be ordering them again. ProsThis is a healthy, delicious gift choice that can be enjoyed by many people. I got this for someone for their birthday and they enjoyed it. A bit pricey, in my opinion, but it was enjoyed. Although I did not get to sample the nuts themselves, I was told by family members that they were delicious. I sent orders to 3 family members and the reaction was the same! They enjoyed the treat for as long as they could...they were gobbled up quickly! I would definitely order them again! all my recipients loved the nut package. shipping was fast and in most cases accurate. I sent it as a gift, so all I know is what was reported. Recipient said it was "very nice", but did not rave about amount, etc. It seemed to arrive in a timely manner. I was very happy with the service as well as the product. The representative who took my order was helpful as well as courteous! She said it was a good value and a popular choice by many customers. I will gladly do business with superior nut company in the future. They take pride in their product and the delivery was exactly when I wanted it. Great company! This is an excellent company regarding the product along with the variety and shipping. I have given this out as gifts as well as orders for myself and have not been disappointed, I will continue to shop here. The search was easy and check out was efficient. Giving it as a gift, howeve the service has been great, received package timely. Smells great. My father was very pleased! Great price for a great nut assortment. Great gift for someone you care about and enjoys nuts. My parents live on the East Coast, and I live in California. I'm always looking for great gifts to send, but since I'm not there to see what actually arrives, it can be hit or miss. 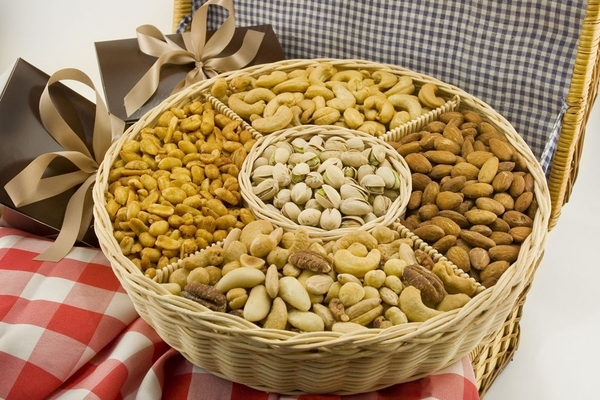 My parents told me after receiving the nuts gift basket that the presentation was really terrific and the quality of the nuts and the amount were all great too. The price is a little steep for just 2.75 pounds, but knowing how well received my gift was makes the price seem better. My boyfriend LOVED his nut basket; he said he couldn't stop eating them, they were very flavorful. The only thing that went sideways was the delivery. It was supposed to be delivered on Feb. 14, Valentine's Day but didn't actually reach him until Feb. 21. I would order again but with caution: double-check the delivery date so it doesn't happen to you. Also, note that the basket doesn't have a lid so the reciever needs to find a container to store leftover nuts in. Merchant Response:UPS is showing a Feb 15th delivery. UPS claims that the delivery delay was due to the fact that a correct street number was missing. Having given this item as a gift for my father-in-law, I cannot speak to its aesthetic appeal or size. However, I do know that the gift was very well received. For any nut-lovers on your gift-giving list, this is a five star purchase! I bought this item last year as a givy and the recipient loved it so much I decided to give it again this year. This could easily become a tradition between me and my dad. Sent the basket to a college student for his birthday. It arrived on time and I heard it was delicious! Thanks again, Superior Nut! You always come through for all my gift giving needs! Sent it as a gift and heard very good things from the recipient! Thanks! The nuts were great.. very fresh.. very good quality. I have ordered from your website before because I know that the quality is superior. My sister called and thanked me for the nuts. She had already eaten some and said they very good. Great gift!! The nut basket was exactly what I was looking for. It was a gift and the recipient is enjoying it. I will purchase from you again. Thank you.